And they often pay huge dividend yields. The top five oil MLPs have an average dividend yield of 5.3%. That’s more than twice the S&P 500 dividend yield of 1.9%. But in The Weekly Profit, I’m on the lookout for safe income opportunities. And while the MLP yields are generous, many of them are very unsafe. The payout ratio is the percentage of net income a firm pays to its shareholders as dividends. So, if a company has earnings per share of $4 and pays $2 in dividends, it has a payout ratio of 50%. Bottom line: The lower the payout ratio, the more sustainable the dividend payment. When supply is rising and demand stays constant, prices tend to fall. Now, MLP revenue is often directly linked to the price of oil. When prices fall, MLPs make less money. The company had raised its hefty dividend for five straight years… by 30% each year! But oil prices were doing the opposite. 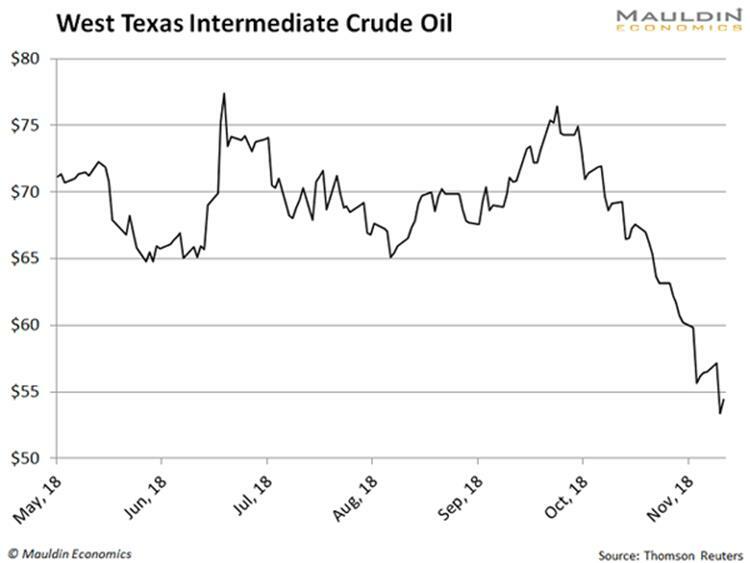 They fell from $105 per barrel in July 2014 to $43 in December 2015. 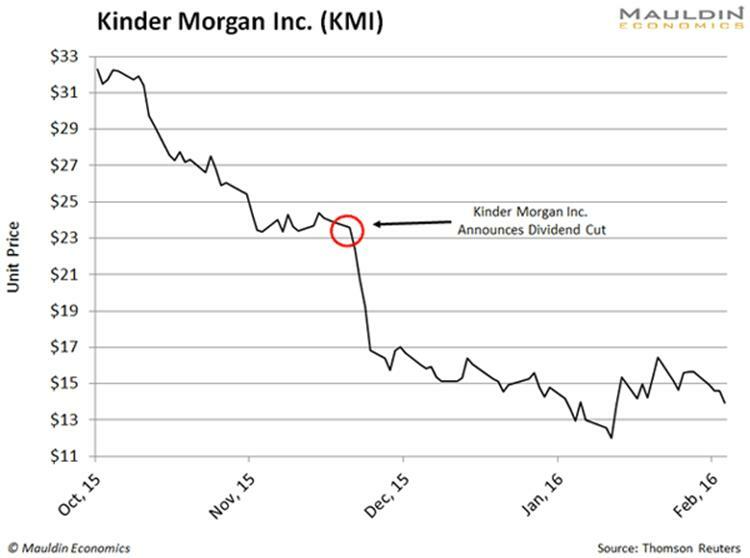 Then the unthinkable happened: Kinder Morgan slashed its dividend by 75%. When you catch the market off guard, you get punished. Following the announcement, shares got chopped 28.6%. To this day, they have not recovered. With cheap oil, the writing was on the wall for many of these companies. Low oil prices reduced the value of the commodity they were transporting. This lowered the company’s earnings and made their dividends less safe. So, whatever you do, steer clear of these ticking time bombs.